Hiking along a mountain stream! Refreshed from mewr break, mew continue along the trail. Soon mew are making mewr way along a lovely mountain stream. Mew love the sound of the running water! 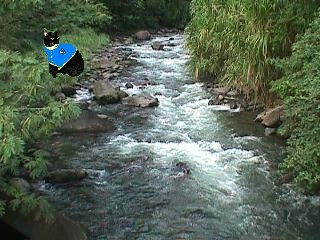 Purr Scouts' Assistant Director Max leads the way and makes sure that none of the Purr Scouts or their guests fall in the stream! Suddenly Purr Scout Leader Calli has an idea! "Let's sing the Purr Scouts' song!" "Yes! Yes!" mews Purr Scouts Gizmo and Taurus. Hey! Ho! Away we go! The Purr Scouts on the trail! Hey! Ho! Here we go! Our friendship never fails! Hey! Ho! Away we go! So much to do and see! Hey! Ho! Here we go! The Purr Scouts wild and free! Mew follow the stream and afur a while, mew spy the Purr Scouts Lake! Oh it is beautiful! Mewr tail quivers with excitement, mew can't wait to go sailing and fishing! Wait! 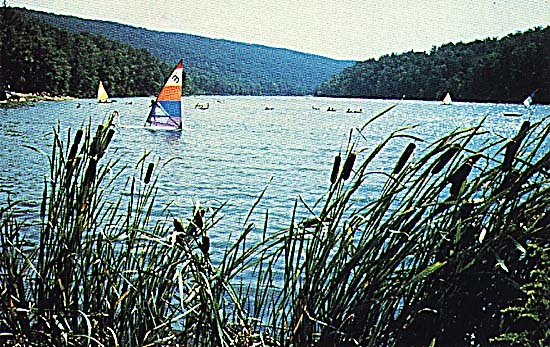 Is that a sail boat already out on the water?